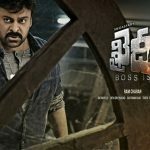 Megastar Chiranjeevi has recently made his comeback after 10 years with the official Telugu remake of Tamil movie Kaththi, titled as Khaidi No. 150. The movie has been released this Wednesday with enormous hype among his fans and as expected received overwhelmed response from audience across the nation as well as overseas. Khaidi No. 150 is the 150th movie of Chiranjeevi’s career and has received much positive reviews from critics also. As per critics, the megastar and leading lady Kajal Agarwal have given wonderful performances in the movie. For their marvelous acting, both are being appreciated by all the viewers. On the opening day (Wednesday), V.V. Vinayak’s directorial this action drama witnessed fabulous response across Telugu states- Andhra Pradesh & Telangana and registered the whopping business of 23.25 crores. On the second day (Thursday), it faced abrupt drop of around 70% in its business graph and did the net business of 6.10 crores. Then on Friday being Lohri holiday, the movie showed slight growth and managed to rake the business of 6.50 crores. On Saturday due to Pongal, Khaidi No. 150 almost similar response and added the amount of 6.40 crores to its account. On the last day of weekend i.e. Sunday, it received decent growth and minted the amount of 7 crores. After the 5-days extended opening weekend, total collection of the movie was recorded as 49 crores. Now it has entered in weekdays and started getting lesser audience in theaters as compare to weekend. On Monday, Khaidi No. 150 faced 50% of drop and collected the amount of 3.50 crores, which has made its 6 days total collection as 52.50 crores and entered in 50 crore club from Andhra Pradesh & Telangana screens.